You know the drill: Biology professor tells students their upcoming exam is going to be insanely difficult. But that's okay, he says, you can cheat! Anything goes. As long as it's not a crime, go for it. Students band together and get creative, and voila! They learn game theory in the process. UCLA professor Peter Nonacs dedicates a part of his Behavioral Ecology course to the study of Game Theory, which he describes as the idea that evolution and natural selection boil down to a series of games, the objective of which is to win. In an article over at Popsci, the professor breaks down a nontraditional approach he took to getting his students to really live the game of everyday life: He let them cheat. So last quarter I had an intriguing thought while preparing my Game Theory lectures. Tests are really just measures of how the Education Game is proceeding. Professors test to measure their success at teaching, and students take tests in order to get a good grade. Might these goals be maximized simultaneously? What if I let the students write their own rules for the test-taking game? Allow them to do everything we would normally call cheating? A week before the test, I told my class that the Game Theory exam would be insanely hard—far harder than any that had established my rep as a hard prof. 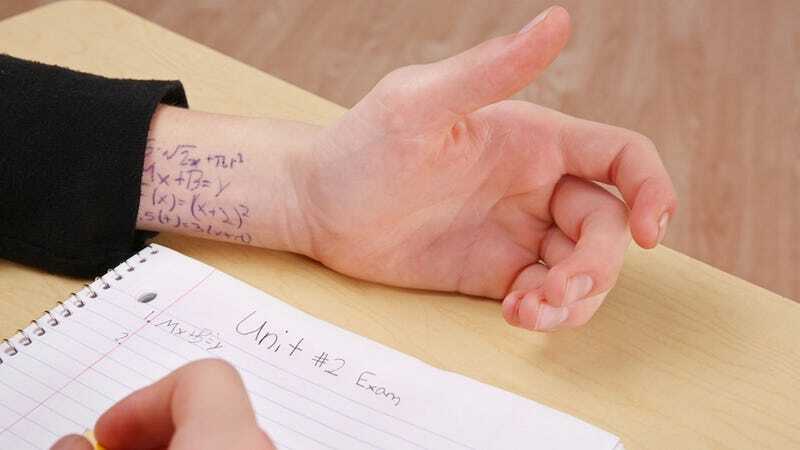 But as recompense, for this one time only, students could cheat. They could bring and use anything or anyone they liked, including animal behavior experts. (Richard Dawkins in town? Bring him!) They could surf the Web. They could talk to each other or call friends who’d taken the course before. They could offer me bribes. (I wouldn’t take them, but neither would I report it to the dean.) Only violations of state or federal criminal law such as kidnapping my dog, blackmail, or threats of violence were out of bounds. Gasps filled the room. The students sputtered. They fretted. This must be a joke. I couldn’t possibly mean it. What, they asked, is the catch? He says the students immediately embraced the idea. Once the shock wore off, they got sophisticated. In discussion section, they speculated, organized, and plotted. What would be the test’s payoff matrix? Would cooperation be rewarded or counter-productive? Would a large group work better, or smaller subgroups with specified tasks? What about “scroungers” who didn’t study but were planning to parasitize everyone else’s hard work? How much reciprocity would be demanded in order to share benefits? Was the test going to play out like a dog-eat-dog Hunger Games? In short, the students spent the entire week living Game Theory. It transformed a class where many did not even speak to each other into a coherent whole focused on a single task—beating their crazy professor’s nefarious scheme. Exam time came, and the test was revealed to be a single question: “If evolution through natural selection is a game, what are the players, teams, rules, objectives, and outcomes?” And what do you know, students broke into all manner of groups, used all sorts of creative approaches, and did a terrific job on the test. For more on Nonacs' methodology, approach and results, go read the whole thing.